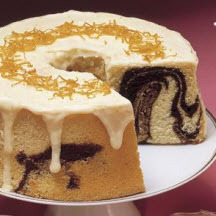 Swirls of chocolate in a luscious orange chiffon cake topped with an orange glaze. Remove top oven rack; move other rack to lowest position. Preheat oven to 325°F (160°C). Stir together cocoa and hot water in medium bowl; stir in 3 tablespoons sugar and 2 tablespoons oil; set aside. Stir together flour, remaining 1 1/2 cups sugar, baking powder and salt in large bowl; add cold water, remaining 1/2 cup oil and egg yolks; beat with spoon until smooth. Beat egg whites and cream of tartar in another large bowl on high speed of mixer until stiff peaks form. Pour egg yolk mixture in a thin stream over beaten whites, gently folding just until blended. Remove 2 cups batter; add to chocolate mixture, gently folding in until well blended. Fold orange peel into remaining batter. Spoon half of orange batter into ungreased 10-inch tube pan; drop half the chocolate batter on top by spoonfuls. Repeat layers of orange and chocolate batters. Gently swirl with knife for marbled effect, leaving definite orange and chocolate areas. Bake 1 hour and 15 to 20 minutes or until top springs back when touched lightly. Immediately invert cake in pan onto heatproof funnel; cool completely. Remove cake from pan; invert onto serving plate. Prepare Orange Glaze; spread over top of cake, allowing glaze to run down sides. Garnish as desired. Orange Glaze: Melt 1/3 cup butter or margarine in medium saucepan over low heat. Remove from heat; gradually add 2 cups powdered sugar, 2 to 3 tablespoons orange juice and 1/2 teaspoon freshly grated orange peel, beating with whisk until smooth and of desired consistency. Makes about 1 1/2 cups glaze.